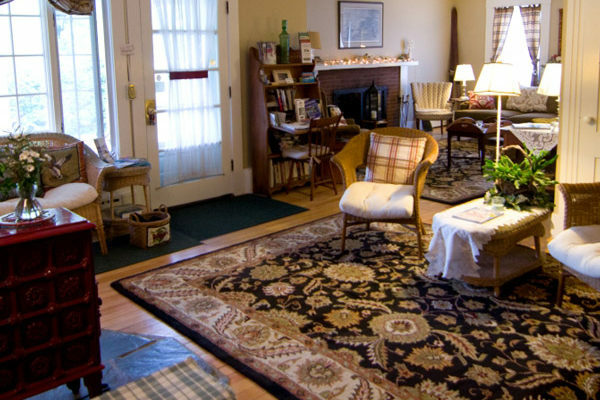 Mountain Fare Inn is a classic New Englander on six lovely acres bordering the White Mountain and Lakes Regions of New Hampshire. Our property includes the Main Inn with seven guest rooms, and the ‘Barn’ with three guest rooms, a game room and a sauna. 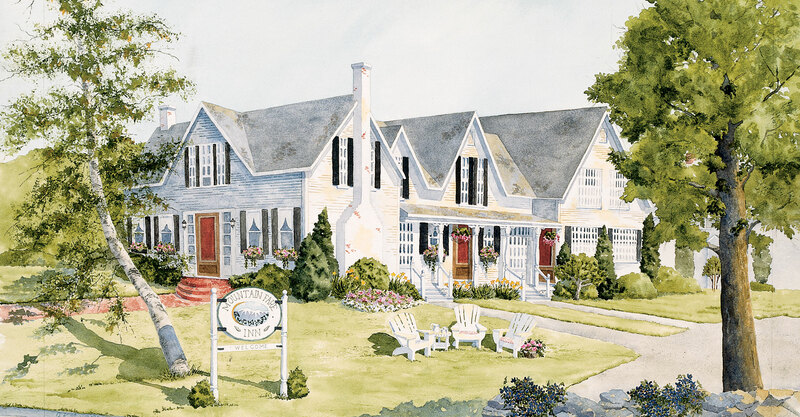 Featuring the antiques, fabrics and feel of country cottage living, Mountain Fare offers gardens and fields in summer, beautiful foliage in fall and a true skiers lodge in winter. Peaceful, warm, friendly and affordable. Living Room – Classic and comfortable. Warm up by the red enamel wood stove. Nap or read by the fireplace. Watch the game or a movie. Plan tomorrow’s hike or drive. Enjoy a glass of wine and relax! Dining Room – The place to be in the morning! Seats 24. We serve hearty, simple buffet breakfasts using quality whole foods, coffee and often our neighbor’s fresh eggs. Something for everyone daily. Notify us in advance about your special dietary needs – vegetarian, Gluten Free, vegan – it is all on our radar. Use our kitchen to self cater your family or group event! It is fun and will be a big saving. You’ll love the rustic dining room with its cottage ceiling, vintage skis, and historic photos. Front Porch – A classic, inviting, south facing farmer’s porch with Adirondack chairs. ‘The beach’. Back Deck – Peaceful, private seating for the summer day’s end. 5 picnic tables on the lawn for the family. Big view of the field and gardens. 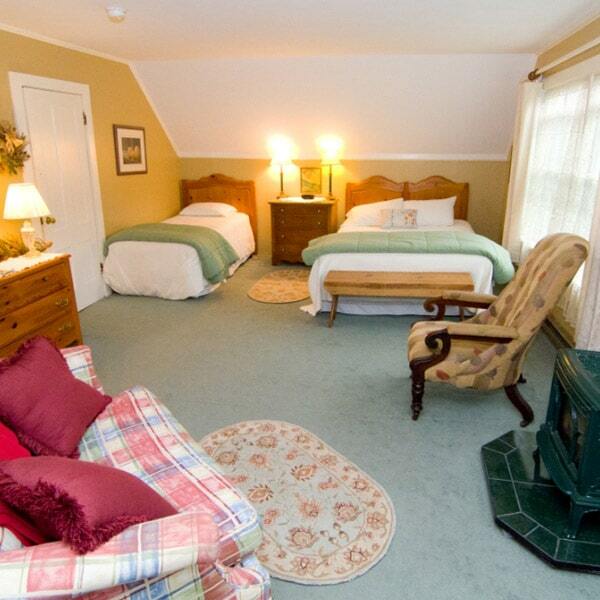 Game Room – A warm and relaxing retreat after hiking or skiing and a nice social venue for friends and family. Pool table, puzzles, chess, board games, wood stove and a TV sitting area. Swedish Sauna – The perfect cure for both stress and the cool weather chills. Use dry or wet -it is pure relaxation! Take the challenge and step out the back door into the cool night and enjoy the incredible stars. 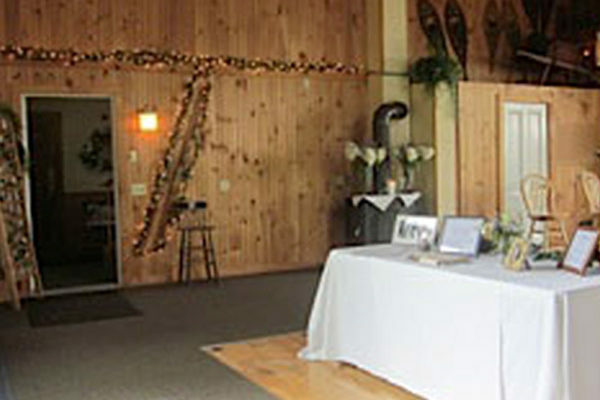 Osceola Party Room – For special events, this rustic, high peaked, wood paneled, wood heated function room can be elegant or casual. Three big barn doors open seasonally to lovely pastoral views. Perfect for non seated events of 30-60 people or dining events for up to 40. Inquire about this wonderful environment for your retreats, family events, parties, business getaways.